With the new year, comes new sales potential. 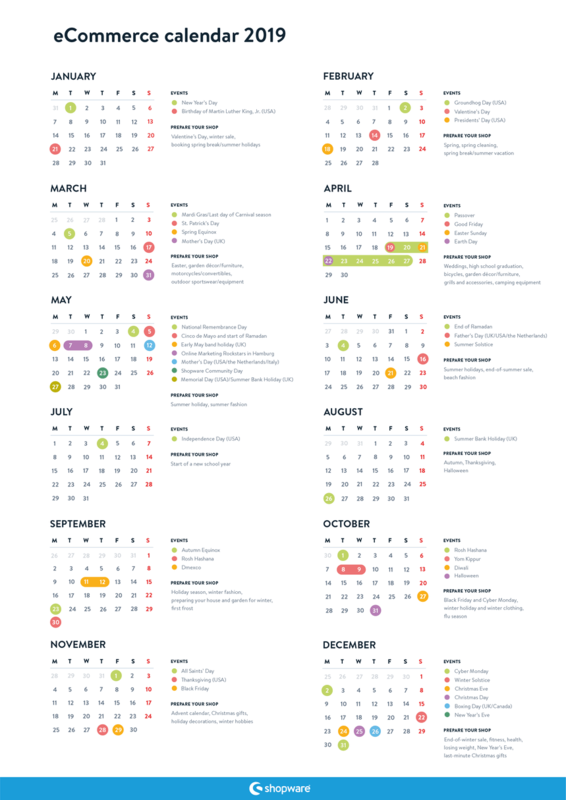 To help you keep track of the numerous profitable opportunities for your online shop, we put together a helpful calendar of relevant holidays and seasonal shopping themes. These key dates can be used as a guide so that you can keep pace throughout the year running timely promotions. So that you always have this important information at hand, we encourage you to save or print this infographic. We wish you a successful new business year! At the close of the holiday season, prices in many shops are falling to attract visitors. In order to boost sales in your shop and create space for new spring goods, attractive bundle offers, discounts, or "Buy 2 - pay for 1" promotions are suitable during this time of year. Easter is just around the corner! Whether you’d like to inspire your customers with great gift ideas, wish them a happy Easter holiday or – in best case – both, with the Premium Plugin, Advanced Promotion Suite, you can plan a variety of promotions, all of which can be created with just a few clicks. Get tips now on how to effectively present your spring/summer product assortment or push your Winter products to make “out with the old and in with the new”. The first warm rays of sunshine lure everyone outside. The car is polished and the garden has been brought out of hibernation… but then you notice: The perfect garden table for cosy barbecue evenings with friends is still missing. Whether garden table, outdoor sportswear, car accessories or other spring equipment, draw attention to your spring offers now and encourage interest for outdoor activities. Could your shop could use some fresh paint? With our tool "Digital Publishing" you can create attractive, SEO-relevant banners for your shop without any programming knowledge. Whether perfume, framed memory or tried and tested voucher, Mother's Day gift ideas are sure to be a hit in your online shop. Remind your customers in advance with banners or newsletters that highlight your assortment of gift ideas. The first warm rays of springtime give you a taste of the summer season to come. Wardrobes have been cleaned out to make room for new shorts, shirts, sunglasses, etc. Now it’s important that you meet the individual tastes of your customers with exciting product recommendations. With Shopping Advisor, your customers can look forward to returning to your shop for perfect product recommendations, while you benefit from higher customer satisfaction and greater chances to increase your turnover. Believe it or not, Halloween is just around the corner. Next to preparing special promotions, now would be the time to consider out-stepping the competition by publishing blog articles that inspire visitors with ideas for decoration tips or costumes. Be sure to make shopping as easy as possible and provide links to your product offering. While your customers are taking advantage of the late summer, now is the time to start preparing for the holidays, which unofficially kick off with Black Friday. Regardless if you’re looking to entice customers with unbeatable deals on Black Friday or appeal to holiday bargain hunters, Shopware’s Live Shopping tool is the perfect plugin to create limited time offers that increase or fall in price minute by minute. Quit smoking, do more sports, eat healthier... At the turn of the year, millions of people are eager to reinvent themselves in some shape or form. Support your customers by offering new sportswear, healthy lifestyle items or even inspire them to adopt a more sustainable attitude. When presented alongside valuable tips, interesting facts or recipes, your products are likely to find their way into the shopping cart. For this, Shopware’s Shopping Worlds and Storytelling features are perfectly suitable for connecting content and commerce.